I think I’ll have to watch that classic movie again now that I have stolen/mangled the title from it. This is a bit of an odd posting because I’m featuring my find of the week but I also wanted to offer something great to eat while it is hot. This is part of my ongoing effort to enjoy the heat we’re getting and not complain. Note to self: Remember February Funk. I got a gorgeous Le Creuset pot at a yard sale with a matching lasagne pan. The lady said she felt badly asking $10.00 for the two. I tried not to cackle in glee as I hauled my goodies back to the car. I’ve used the both so many times since I’ve gotten them but I haven’t featured them as a frugal find-silly me-they rate up there with my tops of all time..
Now back to the mangled movie title. I actually love old movies. TCM gets a lot of play in our house and I inflict Cary Grant in particular on my students whenever possible. They tell me (at the end of the year) begrudgingly that they enjoy them. I rewatched (for the 100th. time) “The Women” recently and found it as sassy and funny as the first time I saw it when I was about 13. What can I say-I was a weird kid. It’s funny how so many of our memories are linked to movies and in my case, since I’m obsessed-food. I love when the two intertwine. 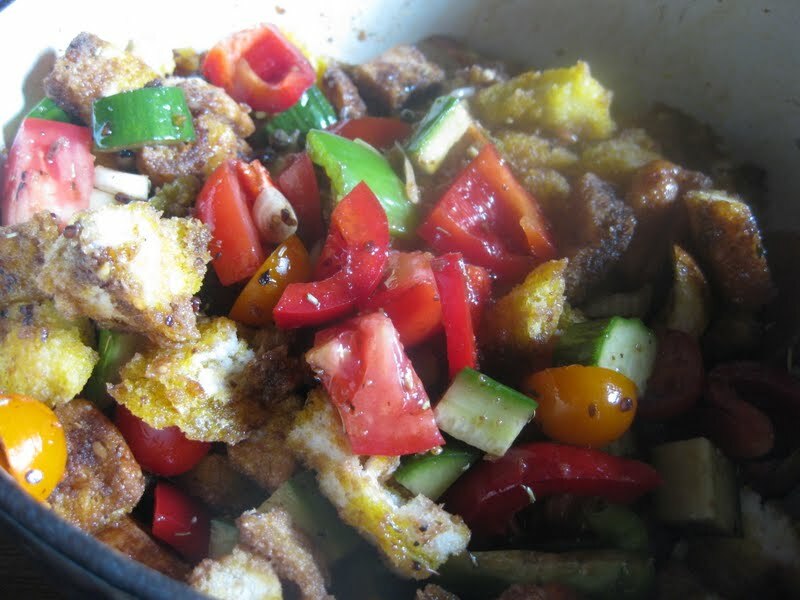 I can’t watch “Chocolat” without making a big batch of spicy, hot chocolate and “Cousins” always means that a large batch of panzanella salad is in the offing. That will be perfect for tonight because even with the heat I know that I’ll have to pony-up my wasted food on Friday and I have gorgeous bread in the house that will wait for no man to be eaten. I’ve gotten this recipe from one of my first cookbooks. A real gem from Marcella Hazan. I don’t even know if it is in print anymore but if you spot it-snap that puppy right up. If you’ve had bread salad before and gone “ick”-don’t worry. Marcella doesn’t suggest soaking the bread in water before hand. She FRIES it in olive oil-that’s my girl! 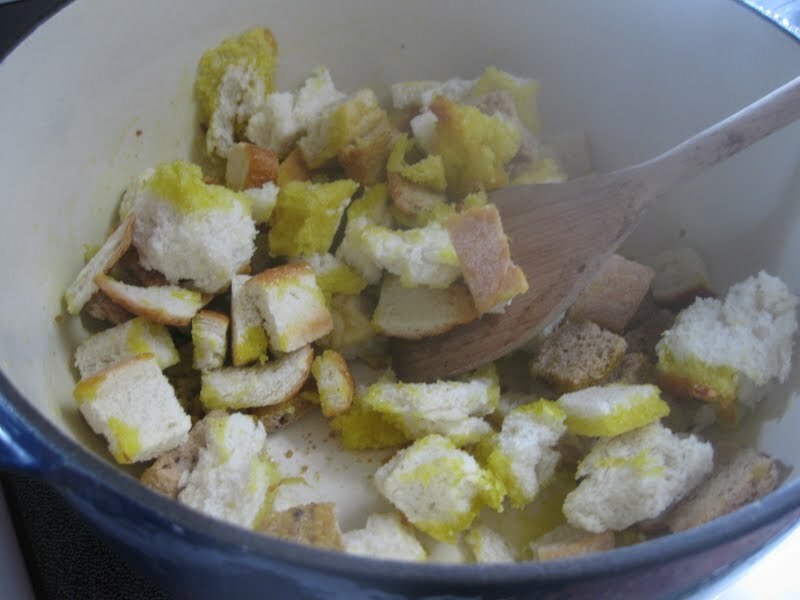 Tear the bread into pieces and heat the 3 tbsp olive oil. 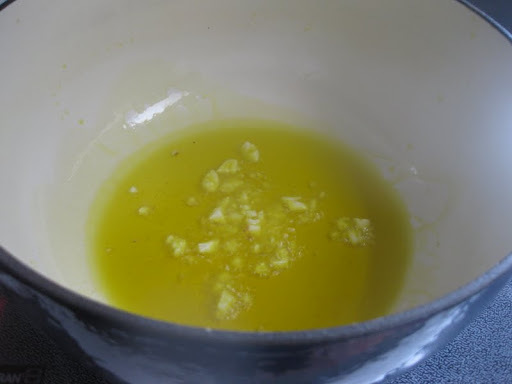 Add the chilli and garlic to the pan and fry for two minutes, making sure the garlic doesn’t get darker than golden. .
Add the bread and fry until toasty. 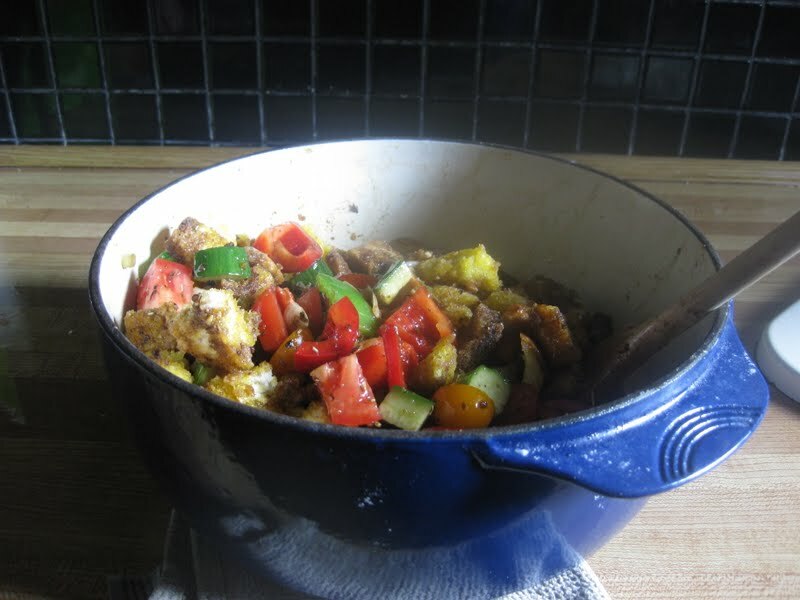 Take everything off of the heat and add your remaining ingredients into the pot. 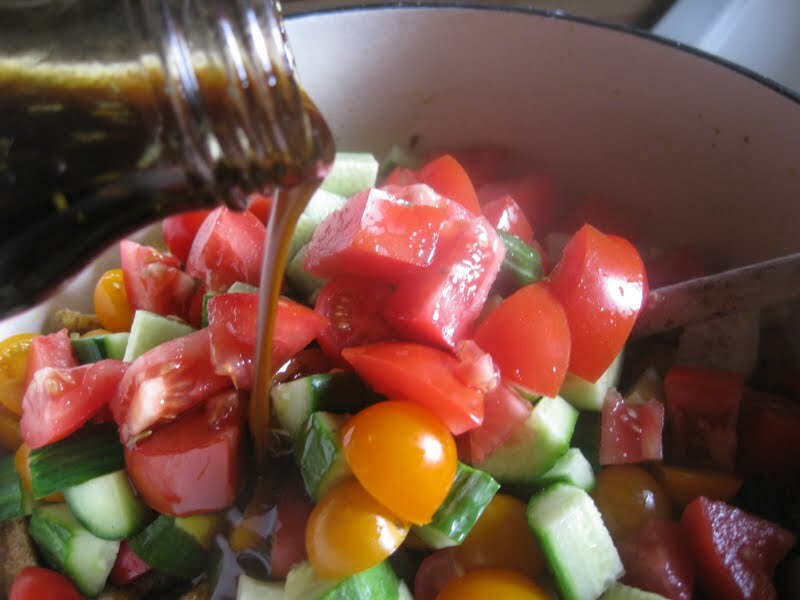 Taste to check for seasoning and for the ratio of oil and vinegar to other ingredients. Ahhh…maybe a nice glass of cold rose wine too (white merlot?). 10$ for Le Crueset?!? JEALOUS. Oh! Houseboat-must see that again really soon. Snapper, love you visiting and your comments are a treat and a half-can I talk you into becoming a follower? Great finds, and what a delicious way to feature them. Thanks for the visits-really appreciate your comments. Any suggestions? Thanks for popping by-I'm off to see what ou spotted this week.